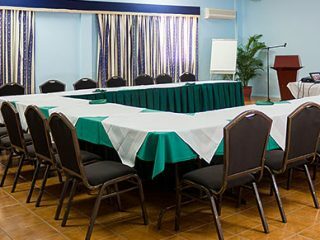 Whether you’re planning a large conference, intimate business meeting, or anything in between, the flexible function spaces and venues at Bay Gardens Resorts are equipped to handle your event in St. Lucia. Featuring a variety of layout options, from seated seminars to standing receptions, our function rooms can accommodate up to 200 guests, depending on your choice of layout. Our state-of-the-art Dolphins Conference Centre at Bay Gardens Beach Resort & Spa is suited for up to 100 guests. Ideal for meetings and social events, this 1,166 square-foot conference facility features a secretariat/office with a computer and printer. In a theatre-style configuration, this room will accommodate 100 guests with ease. Boasting 1,680 square-feet of flexible meeting space, the Bougainvillea Conference Centre features an adjacent outdoor terrace. Located at the Bay Gardens Hotel, the Bougainvillea Conference Centre is our largest conference facility, with enough space to seat 200 guests in a theatre style setting, as well as an adjoining secretariat/office with a computer and printer. Outside, a large terrace is ideal for coffee breaks or cocktail parties. Perfect for cocktail parties and theatre-style presentations, the Ixora Conference Centre at Bay Gardens Inn easily accommodates up to 100 guests. The size and location of Ixora Conference Centre make it ideal for theatre-style presentations, banquets, and other meetings. Featuring 1,088 square feet, it will accommodate 130 guests for cocktail parties indoors and on its breezy outside terrace. One of our smaller meeting rooms, the Begonia is ideal for small meetings and receptions, and can also be used as "pop up" office space. 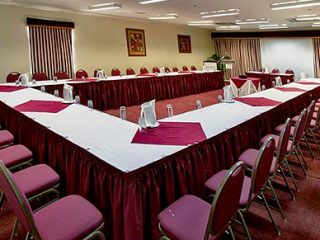 Conveniently located on the Mezzanine level of the Bay Gardens Hotel, this elegant room is suited for all types of meetings. In the theatre set-up, it can comfortably accommodate up to 50 guests. 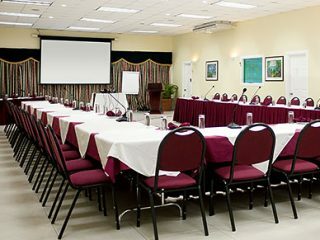 Located near the lobby of the Bay Gardens Hotel, this room is ideal for small meetings, break-out sessions, and cocktail parties. The Lantana Conference Room is a welcoming meeting space and works equally well as a break-out room. Measuring 512 square feet, it can comfortably accommodate 60 guests in a cocktail-style configuration.